During my summers I try to get in a little time for self-education and encouragement for the upcoming homeschool year. I do this by attending conventions, watching webinars, and reading good books. 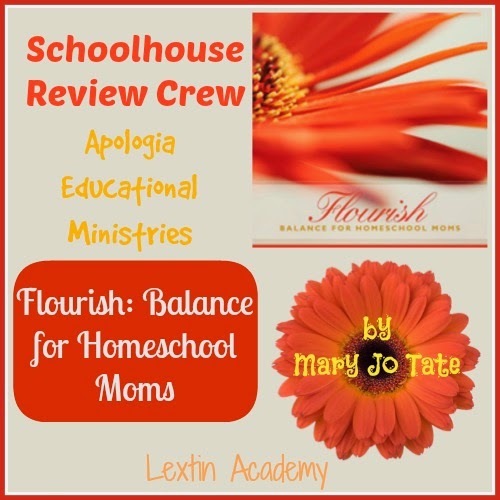 This summer I was blessed to review Flourish: Balance for Homeschool Moms from Apologia Educational Ministries. Apologia Educational Ministries may be known for their science curricula and their newer worldview curricula; however, they provide many other resources. They have published numerous books including some for homeschool moms as a means of support and encouragement. 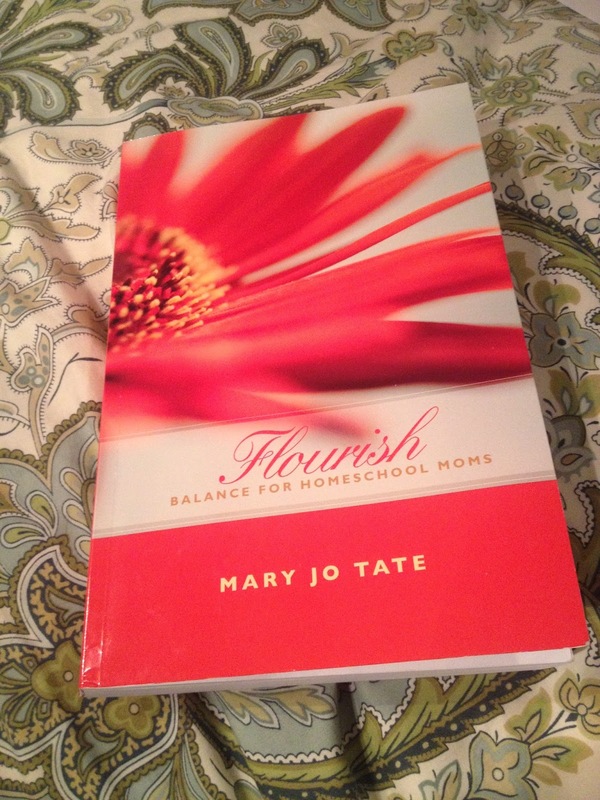 Flourish: Balance for Homeschool Moms was written by Mary Jo Tate. She is a single homeschool mom of 4 boys who also has a successful editing business. In her book, she shares how she finds balance and prioritizes her time in homeschooling, taking care of her children, keeping up with her house, and running a home-based business. This book was written for any mom who desires to find balance in her many roles and enjoy the journey of motherhood. The book contains 16 chapters as well as several appendices of planning forms and tools. I received this book in the mail and began right away as part of my summer reading. I read the book in 1 week because I could not put it down. I found that this book was exactly what I needed to help me focus and plan for my new school year. I’m fairly certain that the author and I could be great friends because we seem to think so much alike. She presented many scheduling and planning ideas that were similar to what I was already trying to use in our homeschool; however, she took them several steps further and gave additional insights that I had somehow missed. It must be the fact that she’s much more of a veteran homeschooler than I am. As I was reading the book I almost skipped the chapters for single moms or for those who run a home business. I am neither and I was sure that they would not apply. I’m so glad I didn’t. The chapter about single moms gave me such a perspective on their struggles while providing ways I can encourage and help. This quote from the author really resonated with me, “If God has called you to homeschool your children, He will provide you the strength, patience, grace, resources, and time to do it. Let your family and your life be a testimony to God’s faithfulness.” I needed that! It’s not just single moms who feel inadequate at times. I think every mom could use a dose of that encouragement. In the chapter for those who run a home business I found advice that proved helpful to me as a blogger – even though my blog is not a money-making business. Mary Jo Tate challenged me to balance my time and to pursue what I enjoy. I found that this chapter inspired me to keep blogging and to work to build my audience and write about topics that are a passion for me. “You have to learn and do simultaneously. Take action by implementing what you learn.” This quote encouraged me to learn more about writing and hone my skills while still blogging. It also challenged me to continue to learn about homeschooling even while I’m in the midst of a busy homeschool schedule. “Find peace in the space between the ideal and reality.” This quote was exactly what I needed. I so often struggle with finding balance and allocating my time between all the things that I would love to do. The book showed me that I have to prioritize my time but more than that, I had to make peace with my to do list and know that there are some things that are not quite important enough to make that list. 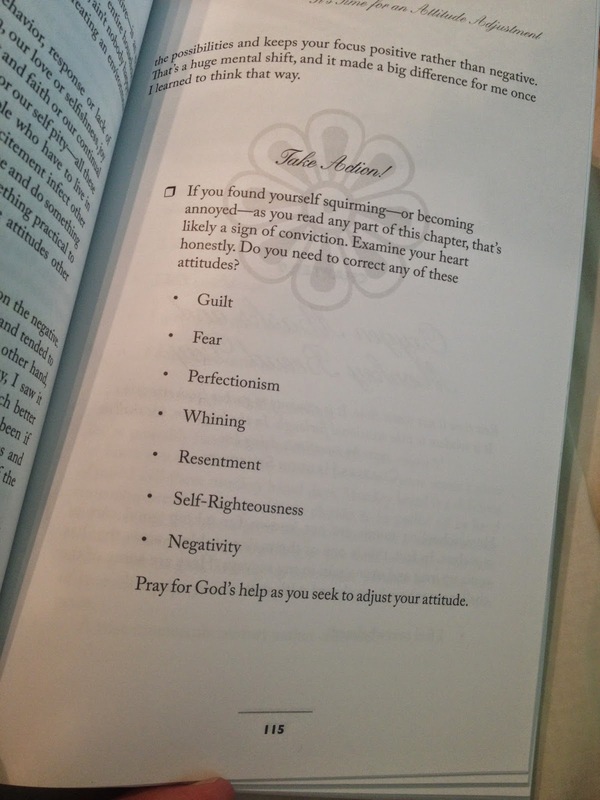 Reading through the chapters on setting goals gave me such freedom to be realistic with myself. With 5 small children, my goals won’t be as lofty as I would like, but I have to be practical with the time I’ve been given. Mary Jo Tate provides a FREEDOM toolbox. It stands for Focus, Reflect, Educate, Eliminate, Discipline, Organize, and Multitask. In the section about educate she encourages moms to continue to educate themselves during the homeschool years. We often are so wrapped up with teaching our children that we forget to educate ourselves and learn new things. This so encouraged me to make time in my schedule for personal reading or some things that I wanted to do and learn. I have found such balance and peace in making sure that I have some snippets of time for my own education and edification. But my favorite part of the FREEDOM toolbox was the eliminate section. This is where Mary Jo Tate encourages the reader to be realistic and to let some things go. There are some things that should not be on my to do list and there are other things that I should delegate or even outsource to someone else. This was so freeing to me! 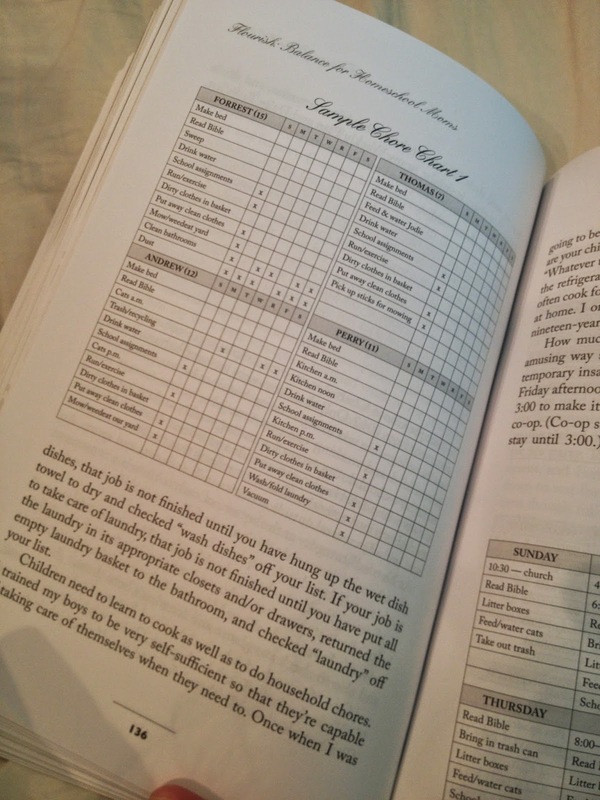 The book also provided practical scheduling advice. The author’s days follow more of a predictable routine in which her children know their chore and schoolwork expectations. She provided sample chore and schedule outlines to help in planning. I found that this chapter helped me begin working on a realistic schedule for next year, remembering to delegate certain subjects or to skip over things that are not a priority. I loved the goal setting chapter! Mary Jo Tate encourages you to write yearly and monthly goals as well as smaller weekly goals. This helped me better organize my goals and create a more doable plan for my weeks and months. She suggested putting goals in categories such as personal, family, and business. She also encouraged the creation of a running to do list and a list of things that need to be stopped because they are not lining up with your overall goals. After working through this chapter, I’ve written down some goals for each month in the categories of personal, family, blog, reading, and homeschool. I also have kept a running to do list where I can jot down everything that pops into my head and then I can add it to certain weeks or months as I find time in my schedule. Mary Jo Tate provides parenting advice for training children to be helpers around the house. I’ve learned that I cannot keep up with the house and homeschooling by myself. This lifestyle is a family commitment and this book has encouraged me to continue to teach my children how to help around the house and encourage family participation. I also loved how she also addressed the attitudes of moms. She challenged me to let go of my perfectionism and my guilt and make peace with the reality that is my current life right now. And once I’ve found peace I can once more enjoy the journey. 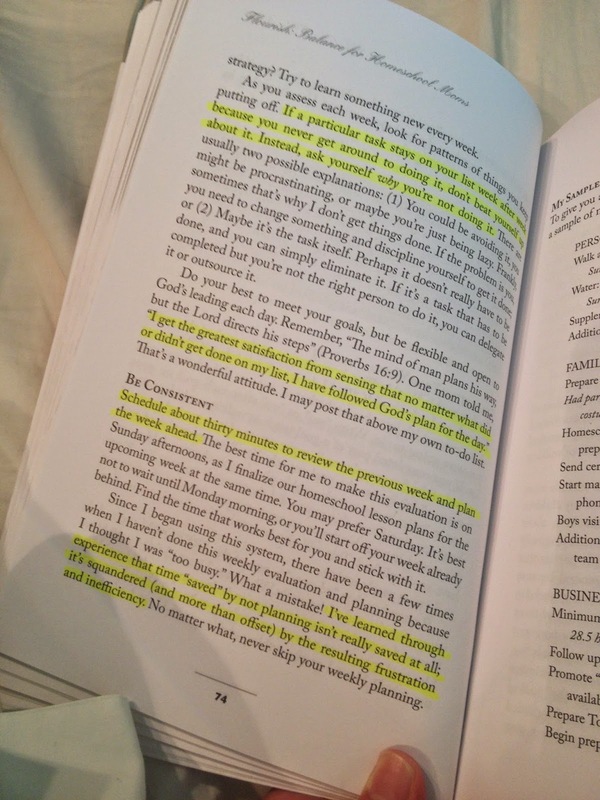 This is quite possibly the most practical and realistic homeschool book that I’ve read in a long time. But what I loved most is that the book is also encouraging and uplifting at the same time. I came away inspired and encouraged to dive into planning for my new school year. The author’s heart for homeschool moms and her experience as a veteran homeschooler shine through her writing and leave you equipped to tackle yet another homeschool year. I have now recommended this book to all of my homeschool mom friends and I plan to read through it every summer to help me refocus and prioritize for every new school year. So, homeschool mommas, go get yourself a copy. I certainly won’t be loaning my copy out! It resides permanently on my nightstand shelf.